In Blogger, currently you will find two types of pages where you can enable default commenting feature. They are post pages and static pages. Generally you would enable comments on post pages as you use them to provide or present your content. But if you wanna disallow comments on specific posts, still you are able to do it. However in static pages, mostly you wouldn't mind disallowing comments at all. You will use static pages to represent static information or use them for specific purposes. But it depends on your requirement. Apart from disabling commenting feature on individual pages, sometimes you may wanna disable default commenting feature entirely from your blog. It would occur mostly if you gonna add or implement external comment system on your blog. However to fulfill your need, here you can learn how to configure comments on your blog, on specific post pages or specific static pages. Here you can learn how to enable or disable Blogger comment feature. This setting will affect to the entire blog. So if you disable it here, readers won't find Blogger comment form on any of your pages. Further if you enable comments on your blog, you can select how you gonna display your comment form or location of your comment form. iv. Go to Posts and comments tab under Settings. v. Select Hide for Comment Location setting to hide comment form from your entire blog. But it doesn't delete comments already made on your blog. Else select Embedded, Full page or Popup window options to enable comment form. iii. Jump to Posts tab from left pane. iv. Now hover on the post you wanna change comment feature and click Edit link correspond to it. v. Click on Options from right pane. vi. 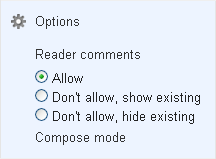 There you can find the setting Reader comments and select the Allow option to enable comments or else select Don't allow option to disable comments for that specific post. viii. Now Preview and Update your post. Blogger let you configure comment feature on your static pages too. However as on post pages, by default, comments are enabled on static pages. If you wanna disable commenting on specific static pages, you have to go through their page options to disable commenting. Read How to Enable or Disable Comments on Static Pages in Blogger. Great tips Mayura as usual. I didn't realize there were so many variations to it! Thanks Lisa :) I had to go through them recently. I thought it would be helpful for others who wanna change per-post or blog-wide comments. Very informative for comments on our blog, and its setting. Thanks for your compliments mate :) Glad you find it informative and hope it helps you to change your settings. You're welcome dear :) Glad it help you out. Thanks so much, Mayura! Your help in this matter is greatly appreciated.... Now, on to other matters.... Gotta check out more of your helpful tips! No, I need to ENABLE comments. You have it already enabled mate :) Click Add a comment link beneath the social buttons over there and you can see the comment form. it didn't work for me, even after I followed the instruction. I don't know what's wrong. Thanks so much! I was replacing Blogger comments with Diquis, which IMO is much better. By default, comments are enabled on post pages. You just need to change settings if you need to disable it only. Hi Mayura, I am trying to disable comments on my blog entirely, I went to edit the one blog post I have so far (I'm still setting things up) and went to options, but under the options list I have no comment options, it just immediately shows compose mode and the options for html use. Not sure why I can't find the option? Thanks! the best solution by far! Mayura, I just created a blog and it only allows Google+ users to comment. How do I disable that and enable regular comments? I believe your blog created with Google+ comments enabled :) You can go over to Google+ tab and turn off Google+ comments feature mate. Then you will find regular comment box up there. If you are not sure about the steps, you can follow this post to locate the setting ~ How to Enable Google+ Comments in Blogger. Hi, I have followed every possible ot tip to ENABLE comments on my blog, but it doesn't work. Hwo can I turn to, what can I do? Facing same problem , but in my blog i think its set to don't allow by default , how to fix? Then you have to enable comments for pages manually, Sam :) Follow the instructions beneath Enable or Disable Comments on Static Pages heading. Glad you enjoyed the post :) Well, sorry for the late reply though. 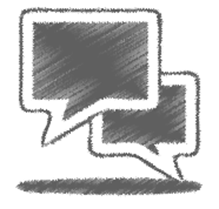 Do you have comments enabled for anyone on your blog? If NO, you can set it up for anyone following this tutorial - How to Set Up Who Can Comment on Your Blog in Blogger. If YES, can you install Disqus again and let me know? Hope this tutorial may come in handy when you install - How to Install Disqus Comment Platform on Blogger. "comments" option is missing from my blogger. Would you help me taking "admin"??? I believe you are using Google+ comments on your blog :) When Google+ comments turned on, you can't access comments via Comments tab.